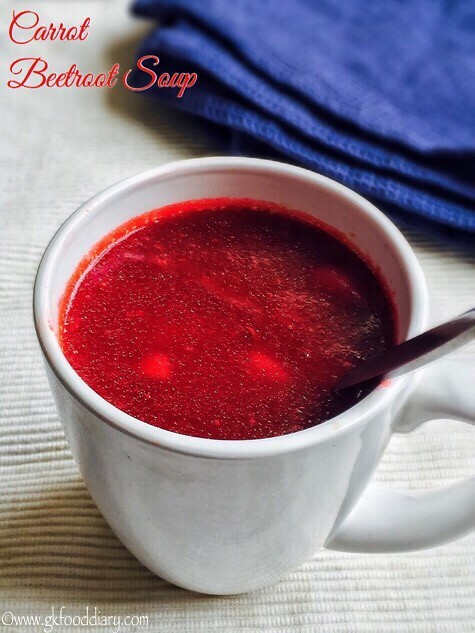 Carrot Beetroot soup – healthy soup with carrot and beetroot. Carrots and beetroots are loaded with nutrients that should be a part of your child’s healthy diet. I have already posted puree with carrot and beetroots. 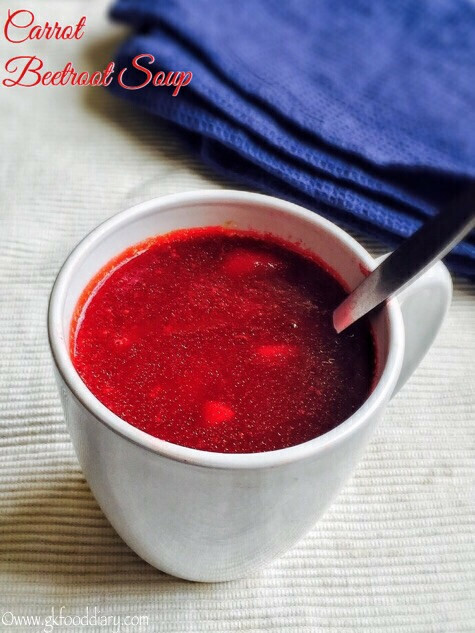 This carrot beetroot soup is much tastier than the puree and hence mostly kids will give a thumbs up for this recipe! It’s very easy to make too. 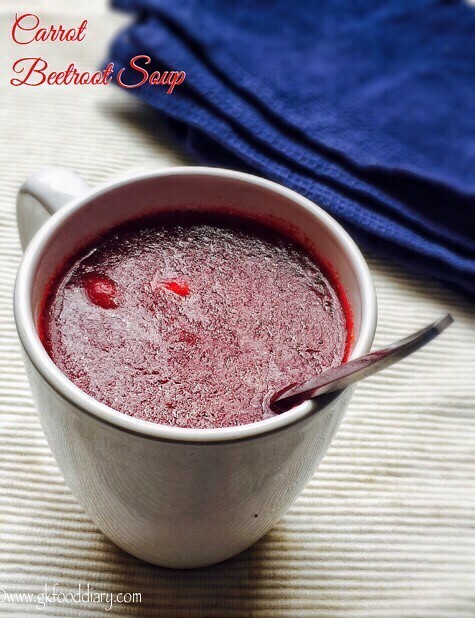 This carrot beetroot soup is ideal for babies from 6 months after introducing beetroot & carrot separate. 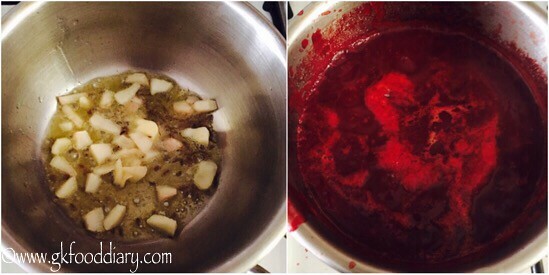 Now Let’s check how to make this easy carrot beetroot soup for babies, toddlers and kids. 1. 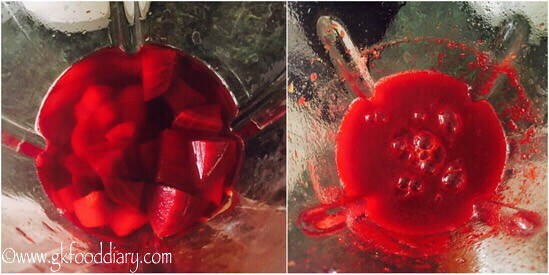 Wash carrot & beetroot in running water well. Then peel the skin off from carrot & beetroots with a peeler. Then chop them into equal size small cubes. Finely chop garlic. Keep it ready. 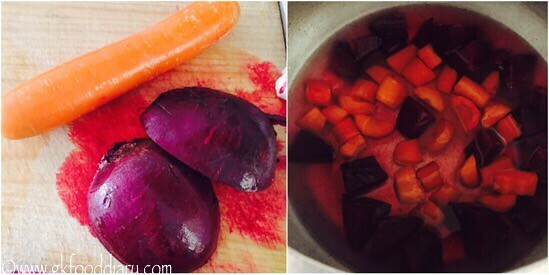 Pressure cook the chopped carrot and beetroot cubes together with a cup of water in medium flame for 3 whistles. 2. Once the pressure is released open the cooker, the vegetables will be soft and transparent. Transfer the cooked ingredients to a blender. Grind it to a smooth paste with the water used for pressure cooking. 3. Then add a tsp of butter in a pan, add cumin seeds and minced garlic. Stir it for 2 minutes. Then add ground vegetables paste along with required salt & pepper powder. Bring it to a boil and Switch off the flame once done. Strain the soup for small babies using a strainer and serve. Healthy beetroot carrot soup is ready. Serve warm! 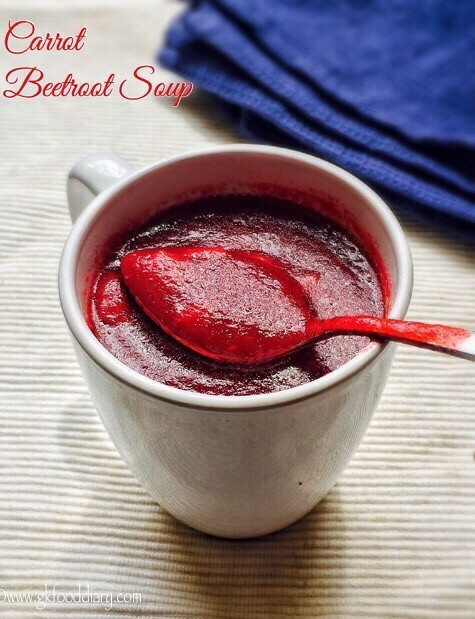 Introduce this carrot beetroot soup to your baby, after introducing beetroot & carrot separate. Skip salt for babies below one year. Also Strain the soup for small babies using a strainer and serve. For toddlers and older kids (if they are interested in eating veggies as such), reserve some vegetables after pressure cooking and add it to the soup after sauting garlic. You can steam cook the veggies instead of pressure cooking. Prefer soups for babies below one year when they are sick or on hunger strike.